Sports today has been the field where all the money is at and the NFL is one of the sports where players are making big-time money. 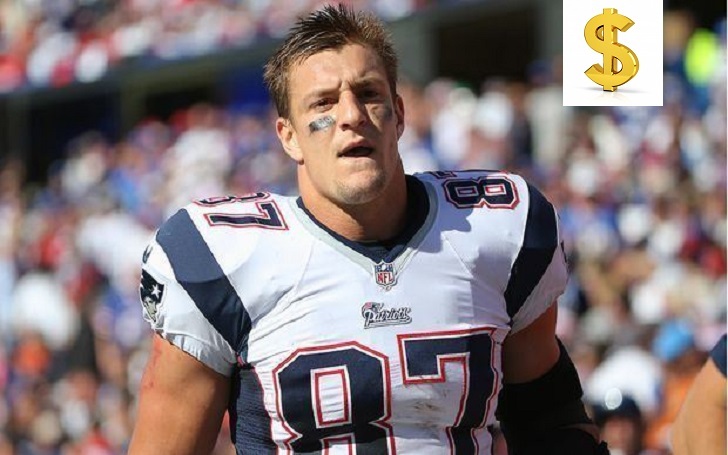 Rob Gronkowski, the 1.98 m tall footballer is a player who is in the top list of getting well paid. Gronkowski, who is currently dating his girlfriend Camille Kostek, is paid the big figures, but his pay is not exaggerated in the slightest bit and he is worthy to deserve every penny that he gets offered. We are here to look at Rob Gronkowski's earning from his profession and to see just how much the footballer's net worth is. When Rob Gronkowski was drafted in the NFL draft back in 2010, he was picked by the New England Patriots in the second round. On his very first signings in his professional life, he was given a $4.4 million for four-year with a $1.7 million signing bonus. That is large money to pay someone who has never ever played a single professional football in his life but that is just how much value the team had seen in him. Gronkowski's contract was extended by the team on June 8, 2012. He signed a new contract for six-year which had the contract extension of $54 million. His new contract also included an $8 million signing bonus. Last season, he made $10.5 million from his annual salary including $2.5 million bonus for being named an All-Pro. Now, the success of being a popular athlete does not just end there for Rob Gronkowski. His annual revenue is not just limited to the salary and bonuses that he receives but also the various endorsement deals that he has such as Dunkin' Donuts, Nike, and BodyArmor sports drink. He says that he does not spend any money on his salary but only spends his endorsement money. Suffice to say, he is making millions every year. Rob Gronkowski has saved up a fortune for himself. According to Gronkowski himself, he has not touched any of his NFL salary that he has made over the years. He lives off the endorsement money and does not spend money without any purpose. Furthermore, he has also claimed that he has invested the NFL money that he has made. It is due to this fact that his exact net worth is not known. What is known for certain is that his net worth is more than $54 million but just how far does the number goes, to find that out we shall have to do some more reviews. Some sources have claimed his net worth to be more than $100 million while other claims it is around $54 million. We shall need a little bit more time to verify it for sure. No matter how big his net worth is, it does not seem to be as big of net worth as his fellow Patriot Tom Brady. Best way to get to the game? With a #LyftLux ride so I can get in the zone and arrive in style. Thanks for the free rides, @Lyft! It does not matter that he does not have a big net worth like some of the highest paid athlete because Gronkowski, unlike other athletes, does not spend his money willy-nilly. The only expensive purchase that he has made is his penthouse apartment in Boston's Seaport District for which he paid $2.2 million for and the house he bought in Tampa Bay for $1.6 million.